Now that all the power-conference bowls are over (there’s still the GoDaddy Bowl between Toledo and Arkansas State), what can and should be said about the bowls? You’ll get many different opinions on the subject. Some will say that the bowls — as non-conference games with plenty of time for the coaches and players to prepare for them — should be seen as major, central representations of how the conferences stack up against each other. Others will say that these are exhibition games (minus the playoff semifinals, of course). Others will say that these are single games balanced against 12- or 13-game regular seasons. Others will say that since a lot of teams — especially in the SEC — schedule non-conference cupcakes in the regular season, these forced matchups need to be assigned more value, not less. Know what? All of these views have substantial components of truth and legitimacy. This is why we wrote about the bowls from various angles in the middle of December — here was one view; here was another; and here was still another. The problem — as is so often the case in college football — is that the sport has a hard time agreeing on the standards and parameters for a given debate. The sport’s disagreement on how much the bowls should or shouldn’t mean parallels the sport’s disagreement on what should qualify a team for the College Football Playoff. Some will say the body of work should matter; others will point to the eye test, others to the winning of a conference championship and any head-to-head result flowing from that. Disagreement is the central reality of the sport, and assessments of bowl games are just one part of the dynamic. Many fans and pundits can be believed and taken at their word when they say they have a certain way of viewing bowls. However, there are plenty of fans and commentators who will shift their point of emphasis based on the way they feel they can spin the facts. For instance, the SEC won seven bowl games this season (thanks to the East going 5-0), tying the national record for bowl wins. On the surface, that seems glossy, but everyone should be able to agree that with the SEC West getting hammered in three New Year’s Six bowls (plus Auburn and LSU losing their non-NY6 games), the SEC had a terrible — not average, not modest, but TERRIBLE — bowl season. Let’s not try to arrive at a verdict on this question — that’s for you to decide as a reader and thinker. Let’s instead offer some food for thought as you try to make your decision and develop your opinions. No judgments here, just think about the question: If Arizona had not gotten smoked by Boise State in the Fiesta Bowl, would your opinion of the Pac-12 — in general or relative to the SEC (or both) — have changed? There is no empirically right or wrong answer here. Just do some thinking about the question and how you evaluate teams and conferences. Much as the SEC East’s 5-0 record was built on the back of games against comparatively weaker opponents — Minnesota (beaten by Missouri in the Citrus Bowl) was the SEC East’s most impressive bowl victim this season — the Pac-12’s six bowl wins mostly came against lesser foes. Oregon and UCLA won truly big-league games, yes, but USC beat Nebraska, as expected. Stanford beat Maryland, as expected. Arizona State beat Duke, as expected… and not convincingly. Utah won an important game against a good Colorado State team, but nevertheless, in a Pac-12-versus-Mountain West clash, it’s expected that the Pac should prevail. What you’re left with is this basic tension: On one hand, the Pac-12 as a whole did not punch above its weight in the bowls — not when looking at its six bowl winners as a whole. 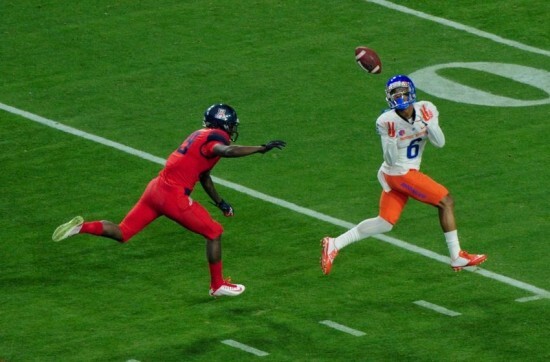 Moreover, Arizona lost to Boise State, the kind of game a division champion and league runner-up should not lose. (Anu Solomon succumbed to big-game jitters. That happens, but it still hijacked much of the Wildcats’ performance. It is what it is.) From this standpoint, the league was not as transcendent as its six bowl wins suggested, much as the SEC’s seven bowl wins don’t indicate a whole lot. The Pac-12 clearly had a much better bowl season than the SEC, but the reality of being expected to win most matchups doesn’t necessarily make the Pac’s bowl season an amazing thing. If you wanted to identify a conference that really helped itself as a whole in the bowls, look to the Big Ten. Ohio State carried the flag against Alabama and Michigan State won a main-event game against the Big 12 champion, Baylor. Other teams (Wisconsin, Penn State, Rutgers) won after being underdogs when the betting lines were first released. The Big Ten was swimming upstream in its bowl matchups and did really well. Strictly within the confines of the bowls, this is better than what the Pac-12 produced. The argument to make for the Pac-12 as the best conference — and it’s a valid one (again, we’re not going to insist that one argument trumps another; that’s for you to determine) — is that the league demonstrated strength at the top. It stands to reason that if two conferences are fairly similar and one of them is stronger at the top, that league should be seen as the better league. Oregon and UCLA certainly did a lot to support that very notion on the West Coast. Beating a credentialed conference champion (Florida State) and a Big 12 team (Kansas State) that won at Oklahoma and West Virginia (and narrowly lost to Auburn) affirmed the Pac-12’s chops. Those bowl wins by Oregon and UCLA are strong statements of quality. Only the Ohio State-Michigan State combo from the Big Ten produced a better pair of bowl wins in a conference. This is what Pac-12 fans can rightly tout at the end of the bowl season. Whether or not you agree that the Pac-12 has supplanted the SEC as the nation’s best conference, everyone can agree that the Pac-12 and SEC exist on similar planes, above the other Power 5 leagues. A tidy way to sum up the bowl season through the prism of conference strength is this: The Pac-12, Big Ten, and Big 12 all showed that they have two really good teams. The Big Ten’s two best teams achieved more than the Big 12’s two best teams, but the Pac-12 has more depth to offer than either the Big Ten or the Big 12, which is why it deserves to be seen as being on par with the SEC… maybe even ahead if you buy into certain metrics or perspectives such as non-conference scheduling and the Power 5/Mountain West composition of 12- or 13-game schedules. At the end of bowl season, conference evaluations — for all the information and context one might bring to them — remain hard to pin down. It all depends on the points of emphasis you use and the questions you ask. If you evaluated conferences at the end of bowl season by asking the question, “Which teams would win right now?”, the Pac-12 would beat the SEC in a runaway. If you evaluated the leagues using the full bodies of work and didn’t place extra weight on the bowls, you’d probably view the SEC as being slightly better than the Pac-12, due to a substantial advantage in slots 8 through 12 and slight advantages in slots 6 and 7, after conceding that the Pac-12 was slightly stronger in slots 1 through 5. Which approach is more correct? There’s no objective answer. You need to come to your own conclusion, realizing that college football — as a whole — does not agree on how to assess bowl games.